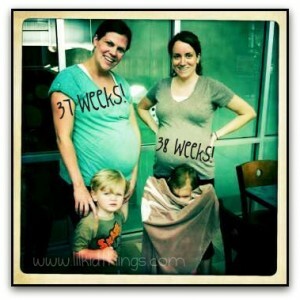 There are an amazing number of women in my life who are or were recently pregnant. Since March, I can count ten women including me that have had or will have babies. One of them is my friend Regan. She is just one week ahead of me and it just so happens that we go to the same Doctor’s office AND the same gym! Her little girl is almost a year older than Oscar and we are both having boys this time, so it’s been really fun to compare notes and hang out through out the past 9 months. She is also someone I like to refer to as, “the slave driver“. See, I have this gym membership and I had hoped to use it during pregnancy, but back there in the second trimester I really ran out of steam. It was SUCH an effort to get there and I just lost motivation. Thankfully, that was about when Regan and I realized that we usually went to the gym around the same time so we decided to sync-up. At the gym after Friday’s workout! Once we had a plan in place you could find us on the elliptical machines at least once if not twice most weeks. We are known by our bellies now and it’s been SO good for me to keep up the exercise! Not to mention the fun we have chatting the minutes away! Now that I am officially FULL TERM (yes 37 weeks is considered term) I have Regan to thank for keeping me honest and getting me to the gym. I feel so much healthier this pregnancy and I know that is part of the reason why. This baby could come any time now and that is pretty amazing. Week 36 was no bueno, but I am bouncing back and ready to do this. Have you placed your bet on when he will arrive?! I just can’t wait! It could be anytime. I had Jack at 37 weeks and 2 days. They induced me though. Liza was scheduled as normal at 39 weeks. Victory loves preparation. Discipline is the best key to have safe giving birth. To avoid so much pain during labor.